Tales from the Real OC (Really! ): Daire Santos is a Cover Girl!! Daire Santos is a Cover Girl!! 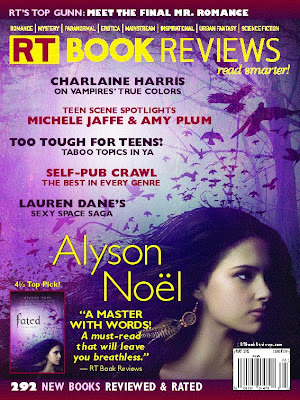 With the FATED release now just two months away (in stores 05.22.12!) I'm so excited to find it on the cover of the May edition of RT Magazine, and it's a Top Pick too!! And speaking of RT . . . in just 3 weeks I'll be heading to Chicago to take part in their annual convention! If you're in the area, I hope you can stop by. I'd really love to see you, and the Teen Day Party promises to be phenomenal! You can see the all of the RT Teen Day details HERE (yep, that's a pic of me signing books at last year's awesome Teen Day!) and my full schedule HERE! Also, THE SOUL SEEKERS official Facebook page is now up and running! To get a sneak peek at chapters 1 & 2, and/or download a free FATED e-sampler, click HERE! Thanks for the info :). I hope you have fun in Chicago.